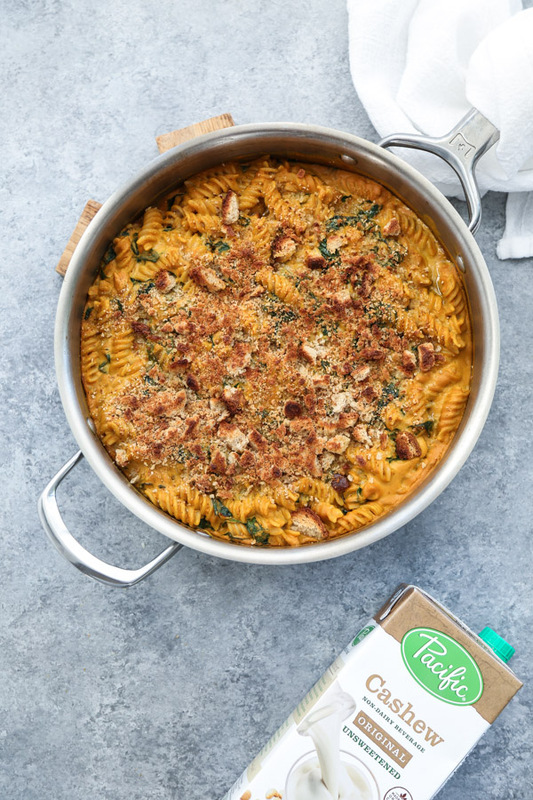 This vegan pumpkin mac and cheese recipe was created in partnership with my friends at Pacific Foods. Thanks as always for supporting the brands that make all my gluten-free pasta cravings possible! Despite growing up in the crunchiest, most granola-y of households, I didn’t encounter nutritional yeast until a few weeks ago. The encounter was prompted by this creamy vegan spinach artichoke dip, and came to fruition thanks to Thrive Market delivering a box of obscure health food store favorites on my doorstep. If you don’t know what nutritional yeast is (I didn’t really), here’s the cliff’s notes: unlike the type of yeast that’s used to catalyze the fermentation process for bread and beer, nutritional yeast is made from sugar cane (not hops) and is deactivated. If you heard the word yeast and immediately started to have candida nightmares, don’t worry. This is not that kind of yeast, and even if you have a bit of a bad yeast problem, it has no effect on the body. The reason why people seek out this strange flakey powder—a finely ground cross between wood chips and bonito flakes—is it’s packed with B vitamins, amino acids, and a host of other minerals. Vitamin B12 is one of the biggest nutrient deficiencies found in Hashimoto’s sufferers. While it’s not naturally produced by nutritional yeast, many products on the market are often fortified with it, making it a very tasty way to eat your vitamins. 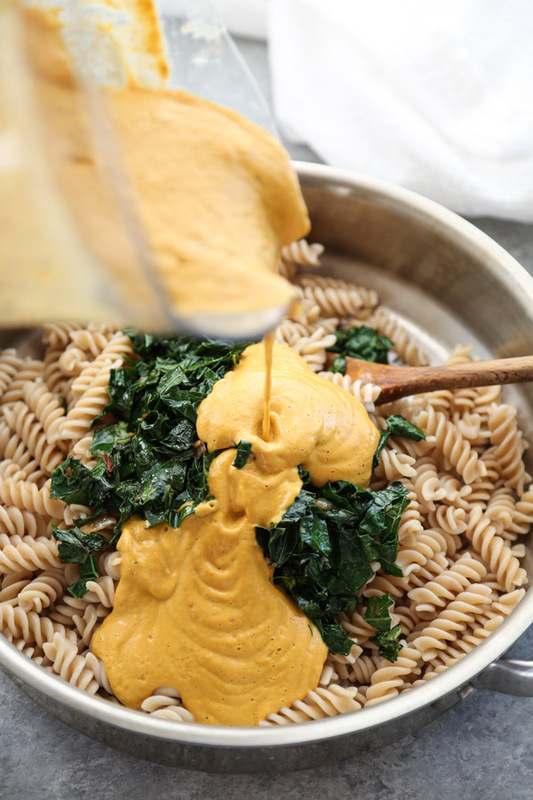 And speaking of tasty, the reason so many plant-based folks gravitate towards nutritional yeast is because of the flavor—nutty, cheesy, savory. It adds that je ne sais quoi to many vegan versions of classic comfort food, including bone broth, gravy, and other creamy sauces. 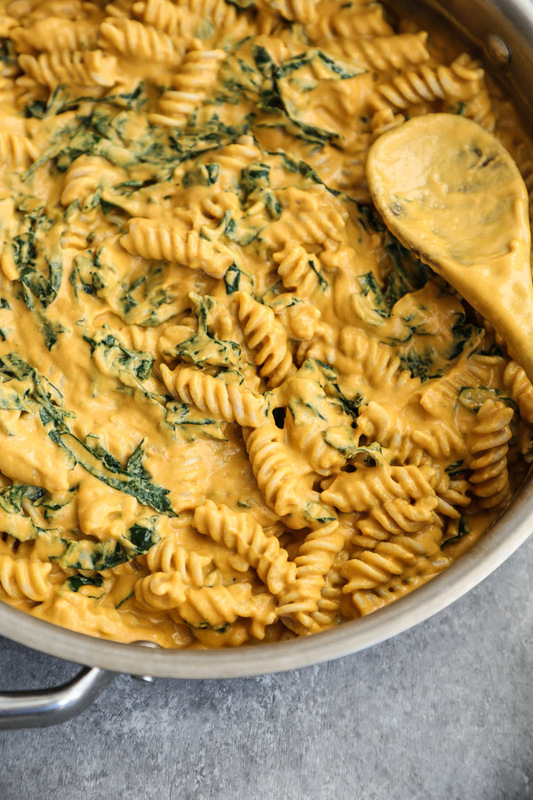 After experimenting with the dip, I knew the next stop on my nutritional yeast journey was a creamy vegan mac and cheese, preferably one that resembled the bright orange goo of my favorite childhood microwavable version. 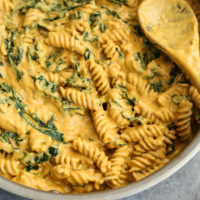 To make the base as creamy as possible, I used a combination of Pacific Foods Cashew Unsweetened Original Non-Dairy Beverage, which on the richness spectrum, is one of the creamiest non-dairy milks around, and their Organic Pumpkin Puree, which is looser than most purees you get in a can and already has an amazing saucy consistency. Whole raw cashews give the sauce even more body, and lemon juice, miso paste and smoked paprika gave the nutritional yeast extra umami, smoke and saltiness. 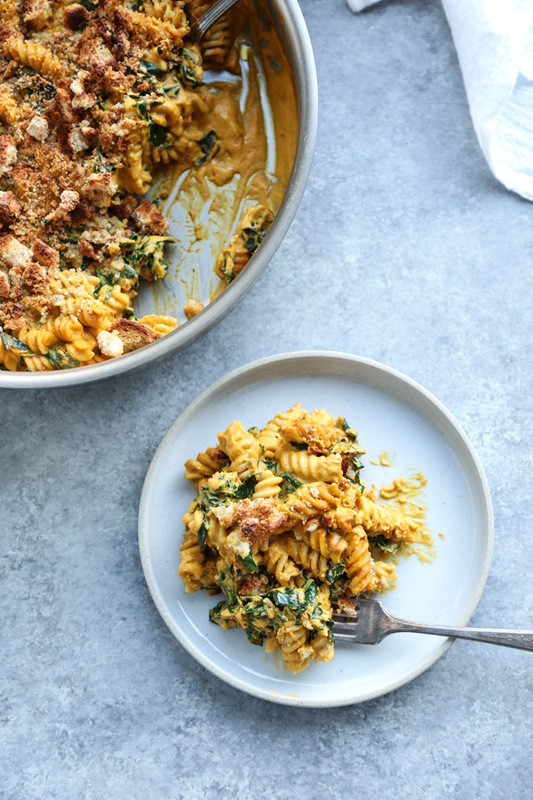 If you’ve been looking to incorporate more plant-based foods into your diet (or have that on the agenda for the New Year) get thee some nutritional yeast and have at this pumpkin mac and cheese recipe. Now that Charlie is dairy-free we have an even harder time finding ways to recreate our comfort food favorites. He was particularly excited about this recipe and couldn’t get over how much it hit all the same notes as my old mac and cheese recipe used to, without the distressing intestinal aftermath. In other news, I head to LA this week for a few days to tape another episode of Hallmark Home and Family! And eat avocados. Duh. If there are any new spots I should check out, let me know! 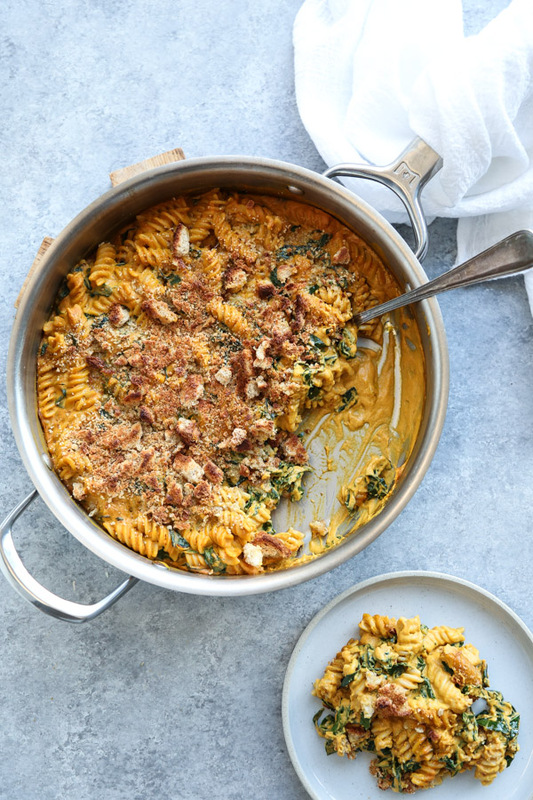 This vegan mac and cheese gets it's creamy base from a mixture of pumpkin, cashews, and cashew milk. It's made even healthier with gluten-free pasta and kale! Meanwhile, heat 2 tablespoons of olive oil in a large oven-proof skillet. Sauté the onion and garlic over medium heat until soft, about 5 minutes. Transfer to the bowl of a blender. Add the kale to the pan and sauté over medium heat until wilted, about 2 minutes. Season with 1/4 teaspoon salt and toss together with the cooked pasta. Set the skillet aside. To the blender bowl containing the onion mixture, add the pumpkin puree, Pacific Foods Cashew Nondairy Beverage, nutritional yeast, smoked paprika, miso, lemon juice and 1/2 teaspoon salt. Drain the cashews and add them to the blender. Puree until very smooth and the consistency of a velvety soup. In a small mixing bowl, combine the breadcrumbs with 1 tablespoon of olive oil, if using. Dinette — cute cafe in Echo Park with counter service. There’s only outdoor seating, so go when the weather’s nice (which is I guess is pretty much always in LA). Get the cardamom tea. Chengdu Taste — in the SGV but really not that far away, especially if you’re coming from the East side/central LA. Crazy good Sichuan food. We tried a ton of stuff, which was all good, my faves were the fish in chili sauce and mung bean noodles. Botanica — hip vegetable-centric food in Silver Lake done really well (I believe this opened in the last year?). I also went to Kismet (which has a similar vibe) and liked that, but not quite as much as Botanica; that said, would definitely go back, because it was very nearly great, and I think it may have just been an off night. Otium — I had a couple of fabulous drinks here (can’t comment on the food) before going to The Broad. Gorgeous restaurant, sounds like it has great seafood. I don’t have cashew milk but I do have all the other ingredients…can I make my own or substitute say, almond milk? SO SO yummy!!! I did cumin and paprika because I didn’t have smoked paprika on hand and it still turned out good. Would’ve added just a little bit more sauce though. first of all-I love your recipes! I’m considering making this dish tonight (looks delightful) but I was wondering if I could skip the miso? Solely because I don’t have any in the kitchen. I just wasn’t sure if it would make or break the dish? yes no problem! hope you love it! Hi Phoebe, Hope all’s well. 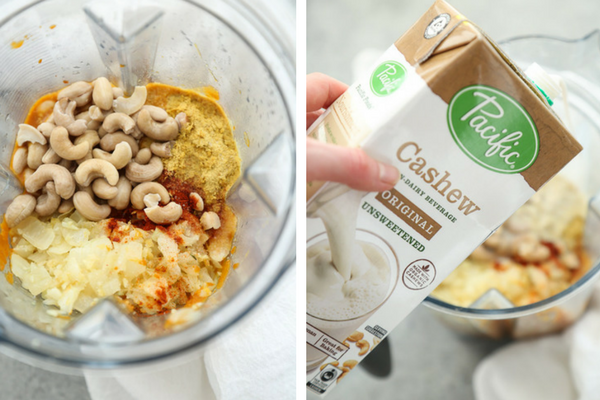 Have you tried this with regular dairy (vs nut milk) and maybe some sub for cashews? I want to make it to accomodate a nut allergy but not sure how much I can modify.